Financial donations directly amplify our outreach, and are necessary for the Initiative to be effective. Funds support all our activities ? from outreach materials (such as this website) to direct interactions with government ? 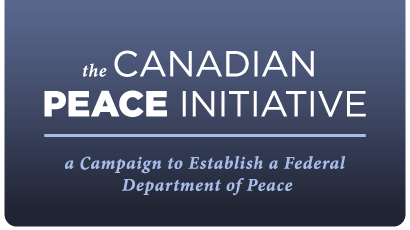 bringing an awareness and understanding of this initiative to Canadian citizens and government. Please consider making a one-time or monthly contribution, an investment in our country and international peace. Note that you can give a donation ON BEHALF of a friend or family member, making it an excellent present. Just include their name in the "This donation is on behalf of:" field on PayPal's final check-out page. There has rarely been a greater urgency or a better window of opportunity to consider the creation of a Department of Peace in our country.